Sometimes it takes a while to truly appreciate things and so it has been with my Osprey Mutant pack. Like a trusty old pair of boots the Mutant has been my default go-to pack for the past two years. Whether its backpacking through Vietnam or Cuba, wildcamping in Wales, scaling a 4,000 peak in the Alps or a climbing weekend on the south coast, the Mutant has taken it all in its stride – quietly, efficiently. I must admit it was the looks of the Black Diamond Speed 40 that led me astray briefly last summer, but it’s the Mutant I returned to. Osprey have managed to straddle that rare mix of being simple yet functional, including the features that matter yet minimising excess, focusing on stuff that does the job as intended. It’s large for its purported 38 litres – probably nearer in size to a 45l pack – and more as the floating-lid extends to add a further 10l if necessary. Two lid pockets, outer and inner, give a degree of practicality but if you like pockets and faff then this pack’s not for you. Under the lid is a rope strap which as well as being handy for, erm, holding a climbing rope or helmet, helps secure any load when the pack is full and when the lid is removed. The shoulder straps and hip-belt are high-density foam, slim-profile but comfortable. Inside is the obligatory bladder pocket and a removable 3-fold bivvi pad. The EVA foam back panel is relatively flat but this helps with stability with a heavy load, but does mean it’s prone to giving you a damp back in hot weather. There are no outer pockets, but there a couple of small wand pockets – so small in fact I forgot they were there – but they do help secure walking poles. The Z compression straps work well in pulling the entire sides of the pack inwards to reduce volume – far more effective than two separate compression straps as the whole volume is pulled inwards. Twin re-inforced axe loops and 3 hauling points betray the packs climbing credentials, as do the hypalon loops on the hip-belt – which take a carabiner or ice-clipper. The material strikes a great balance between being lightweight but reassuringly robust. 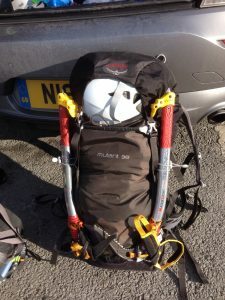 It’s a bit stiffer/sturdier than lightweight packs such as the Talon, so it doesn’t flop around when empty (one of my pet hates with many lightweight packs. I’m happy to cram in climbing gear without the worry I’m going to puncture it. And it’s shrugged off numerous airport baggage systems without any real signs of wear. 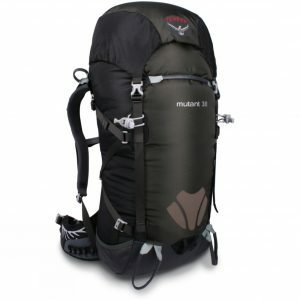 The pack’s versatility is aided by the fact that its strippable with the lid, hip-belt and back-pad removable, which reduces the weight down from 1.3kg to a more respectable 900g. A two-day ascent of the 4,000m Gran Paradiso meant starting in a hot valley with all my winter gear stowed in a full pack. On reaching the overnight hut I stripped off the lid and and removed the bivvi pad to shed weight for the summit ascent, the Z compression straps collapsing the volume effectively when I wore most of my gear for the final summit push. Niggles are few and far between. Perhaps the back is a touch too long for me, though Osprey do three different sizes, so blame me. The closure buckles are a little small for handling with gloves but that’s about it. It does what it’s made for and more – simply, discreetly and reliably – a great all-rounder pack which I can highly recommend.